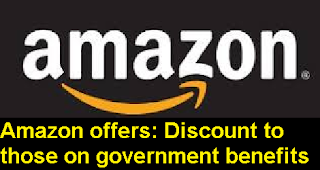 People who have a valid Electronic Benefits Transfer card, used for programs such as the Supplemental Nutrition Assistance Programs, or food stamps, will pay $5.99 per month for the Amazon Prime benefits like free shipping and unlimited streaming of movies and TV shows. NEW YORK (AP) — Amazon is making a play for low-income shoppers. The online leader is offering a discount on its pay-by-month Prime membership for people who receive government assistance. The move, announced Tuesday, is seen by some analysts as an attempt to go after rival Walmart’s lower-income shoppers. The world’s largest retailer has revamped its shipping program and improved other services to drive online sales growth as it tries to narrow the gap with Amazon. The typical Prime membership is $99 a year, but those who cannot afford to pay up front also have a $10.99-a-month option. Amazon designed this option to make its “selection and savings more accessible, including the many conveniences and entertainment benefits of Prime,” Greg Greeley, vice president of Amazon Prime, said in a statement. Walmart has gained momentum in its online business, seeing its e-commerce sales soar 63 percent in its first quarter, up from a 29 percent increase the previous period. It now offers free-two-day shipping for online orders of its most popular items with a purchase of $35. Online shoppers who collect their purchases at a store get extra discounts. And Walmart has dramatically expanded its online offerings — though it’s still far behind the hundreds of millions of products at Amazon.com. Amazon’s aim with the latest move is two-pronged, says Ken Perkins, president of research firm RetailMetrics. Amazon offers discount to those on government benefits The move, announced Tuesday, is seen by some analysts as an attempt to go after rival Walmart’s lower-income shoppers. The world’s largest retailer has revamped its shipping program and improved other services to drive online sales growth as it tries to narrow the gap with Amazon.